『신위 해서 천자문(申緯 楷書 千字文)』은 자하 신위(1769~1845)가 69세 되는 1837년(헌종 3)에 쓴 것으로 조선시대 천자문 가운데 노년에 속하는 예이다. 현재 신위가 쓴 행서 대련이나 병풍 필적이 다수 알려져 있는데, 이에 비하여 천자문 필적은 오직 이것뿐이다. 글씨는 노년의 원숙한 필법을 보여주는데, 서풍은 당나라 구양순(歐陽詢)에 바탕을 둔 청나라 옹방강(翁方綱)과 유사하면서도 옹방강에 비해 좀 더 부드럽고 단아한 필치이다. 이 필적은 서첩으로 장황되었는데 “천자문(千字文)”이라 쓴 표제도 신위의 필적으로 여겨진다. 개장(改裝)의 흔적이 없으며 보존상태도 양호하다. 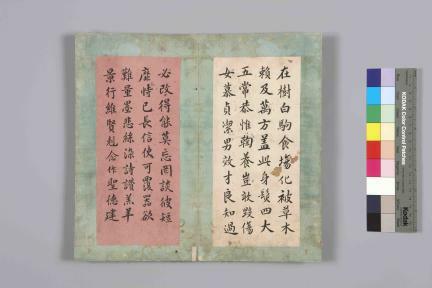 This Thousand Character Classic in regular script was written in the hand of Sin Wi (1769-1845, pen-name: Jaha), in 1837 (the 3rd year of King Heonjong’s reign) when he was sixty-nine years of age. 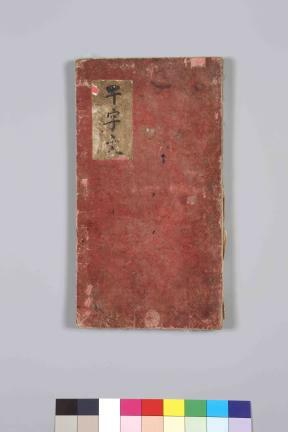 This is one of the oldest surviving copies of Thousand Character Classic from the Joseon Period. Brushwork samples of Sin Wi, thus far known, include daeryeon (pairs of two long strips of paper with calligraphy) in semi-cursive script and folding screens which have survived in large numbers. This is the only copy of Thousand Character Classic written by him. The brushwork of Sin Wi of later years displays maturity and assuredness, and, while similar to that of Weng Fanggang, a Qing-dynasty calligrapher whose style was largely influenced by the Tang-dynasty master Ouyang Xun, Sin Wi’s is softer and more graceful than the latter’s. This book, bound like a calligraphy album, has the title on the cover page, which also appears to have been written by Sin Wi. The book is well preserved and shows no traces of having been rebound.